Merete Halkjaer Olesen (left) with Lindsey du Toit. 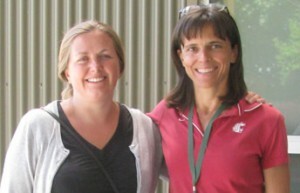 Dr. Merete Halkjaer Olesen, plant pathologist at Aarhus University in Flakkebjerg, Denmark, visited Dr. Lindsey du Toit’s vegetable seed pathology program at the WSU Mount Vernon NWREC from 20-23 July 2015 to work on diseases in spinach, table beet, and Swiss chard seed crops in northwestern Washington. Merete’s research has focused on diseases in spinach seed production in Denmark, where ~15,000 acres of spinach seed crops are grown annually. 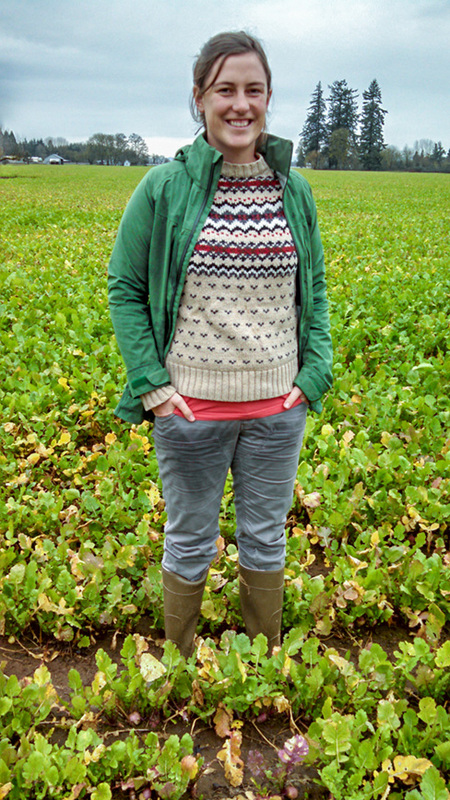 Shannon standing in a turnip seed crop in the Willamette Valley of Oregon that was infected with black leg, light leaf spot, and white leaf spot. Congratulations to Shannon Carmody, MS student in Dr. Lindsey du Toit’s vegetable seed pathology program, on applying successfully for a Western SARE Graduate Student Proposal Award. Her proposal was titled “Seed Transmission and Management of White Leaf Spot and Light Leaf Spot Pathogens in Brassicas in the Pacific Northwest”. The funding ($15,675) will help cover expenses for her thesis project. Shannon’s thesis committee includes Dr. Lindsey du Toit (chair), Dr. Lori Carris (WSU), Dr. Tim Paulitz (USDA ARS), and Dr. Cindy Ocamb (Oregon State University). 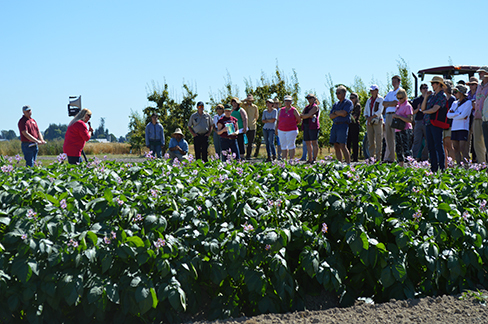 Pollination, plant pathogens, and pesticide alternatives are a recurring theme in the 2015 WSU Mount Vernon NWREC Annual Field Day, which includes a lengthy walking field tour, research project updates, and an agricultural community barbecue here July 9. The Annual Field Day, which began in the 1940s, is free and open to the public. It starts at 3:30 p.m. with a walking field tour of some of the nearly 150 acres of the Center’s active research plots. A tractor-driven wagon ride will service non-walkers, and Spanish language translation services will available throughout the tour from Kate Selting, Latino Farmer Outreach Educator with the WSU Small Farms Program/Skagit County Extension. Faculty members and graduate students representing the Center’s current Research and Extension programs will talk about their projects and how their work impacts the region’s growers, consumers, agricultural businesses and local economies. WSU Mount Vernon’s mission is to serve the agricultural, horticultural, and natural resource science interests of the state through research and extension activities that are enhanced by the unique conditions of northwestern Washington: its mild, marine climate, rich alluvial soils, diverse small and mid-sized farming enterprises, and unique rural-urban interface. This year’s Field Day presentations highlight all of the Center’s research programs: plant breeding, small fruit horticulture, berry pathology, entomology, vegetable seed pathology, vegetable horticulture, vegetable pathology, weed science, and dairy/livestock. 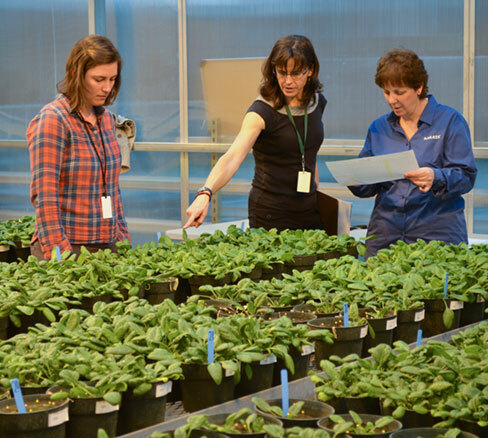 Three of the represented research programs are working on projects to help growers productively respond to issues involving pollination, plant pathogens, and pesticide alternatives. Included among the presenters are Small Fruit Horticulture Program Leader Lisa Wasko DeVetter and her Ph.D students, Rachel Rudolph and Matt Arrington, who are respectively studying new options to promote the sustainable production of raspberries and blueberries. 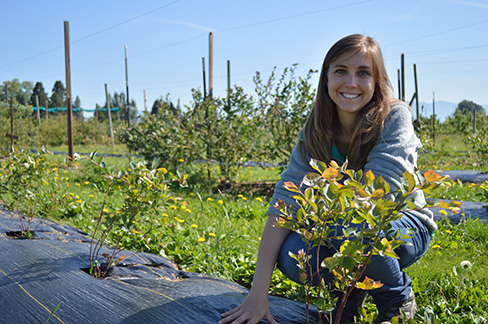 Arrington’s research project involves enhancing pollination and fruit set in blueberry. “Matt has been building on some of my earlier work to understand factors that limit fruit set and yield of blueberry in western Washington,” said DeVetter. “We have confirmed that visitation rates of honeybee (Apis mellifera) is very low in western Washington, which is likely due to unfavorable weather conditions. We have also observed that visitation rates are greater in organic fields. “My program is developing recommendations on ways to promote and optimize honeybee activity and overall pollination for blueberry,” she added. 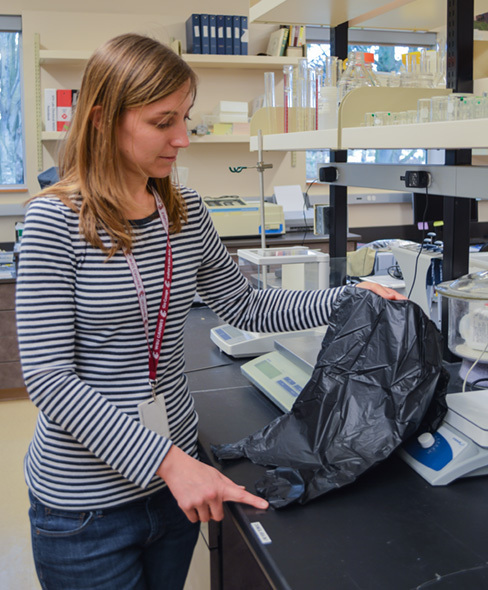 The Vegetable Seed Pathology team will provide updates on its ongoing research, including the impacts of bacterial pathogens in table beet and Swiss chard seed crops and fungal pathogens of plants in the cabbage family, according to program leader Lindsey du Toit. M.S.students Shannon Carmody and John Weber will provide information about their respective work with brassica species and sunflower seed production. “Shannon’s research project involves evaluating how readily certain fungi that infect brassica plants can be seed transmitted in brassica species and whether seed treatments (organic and conventional fungicides) being used by growers and seed companies around the world will help prevent seed transmission of these fungi,” said du Toit. “John will discuss his project working with sunflower seed growers to improve their management practices for white mold, caused by the fungus Sclerotinia sclerotiorum, which has emerged as the main disease affecting the burgeoning sunflower seed production industry in Washington,” she said. Weeds impact all crops, and Weed Science Program Leader Tim Miller and his Ph.D student, Yushan “Sherry” Duan, will be on hand to discuss some results of that program’s new product testing and research which has yielded new techniques for weed management. “I’ll be discussing weed control – including in three types of crops: seeds crops, berries, and ornamentals,” Miller said. “Seed crops include the vegetable crops (primarily table beets, spinach, and cabbage) that are grown in northwest Washington and a new potential crop (quinoa) for the state. The Center’s Annual Field Day will wind down at approximately 6 p.m. with a barbecue on the grounds near the Center’s Tree House meeting space, where visitors can enjoy a locally prepared meal and connect with others in the agricultural community. More information about this year’s event is available from Field Day Coordinator Susan Kerr, 360-848-6151, kerrs@wsu.edu . Links to specific program research are available on the WSU Mount Vernon website, http://mtvernon.wsu.edu/. Flavor in many forms will be featured at this year’s Small Grains Field Day here at the Research Center from 3 to 6 p.m. June 25, 2015. 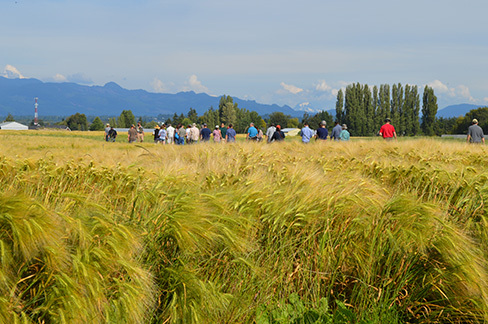 The annual event, which is free and open to the public, gives the community of growers, industry representatives, and consumers a chance to network and learn about the latest small-grains research and how it impacts the economy in the Skagit Valley and beyond. Small grains include wheat, barley, oats, and the pseudo-cereal grain buckwheat. This year’s Field Day highlights examples of the latest varieties specifically bred for and adapted to the mild marine climate of the Pacific Northwest, according to Steve Lyon, senior scientific assistant for the WSU Mount Vernon plant breeding program. For organizers and attendees alike, Small Grains Field Day provides something for the whole community. “Whether we’re developing seed for farmers, amassing knowledge among researchers, or opening new niche markets for millers, bakers and maltsters, we are working together to build sustainable, high-quality, high-yield, disease-resistant small grains production in the Northwest,” said Lyon. This marks the fifth year WSU Mount Vernon researchers have been breeding winter wheat for this region. 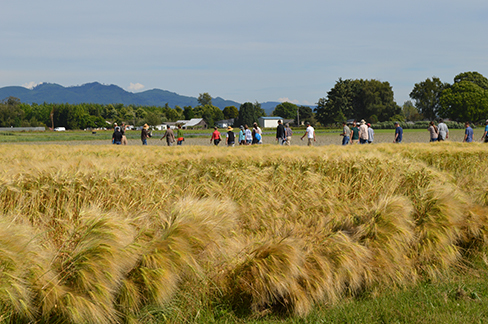 “Several wheat varieties already earning praise for their flavor have been bred, selected, produced and milled in the Skagit Valley,” Lyon said. “And there are even more promising varieties with the potential to grow well and be successfully utilized here on the west side of the Cascade Mountains. “What is unique about these lines is that before one is released to the public, it will not only excel agronomically but must make a high-quality, flavorful end product,” he added. There are also some promising hard red and soft white winter wheats from private European companies, and some spring varieties through CIMMYT “which do well in high rainfall areas and are especially good for bread wheat,” Lyon said. CIMMYT is the Spanish acronym for the International Maize and Wheat Improvement Center, a non-profit organization based in Mexico that researches sustainable development of wheat and maize farming worldwide. It provides seed, agronomy and agriculture research products, services and related tools to farmers in developing countries and maintains a seed bank which makes seed freely available to researchers. At WSU Mount Vernon, plant breeding researchers grow and test the seed to determine suitable grains for this climate. In The Bread Lab, testing is taken to the next level to determine the qualities of local small grains that make them desirable for milling, baking and malting. More information about Small Grains Field Day and the WSU Mount Vernon Plant Breeding Program and Bread Lab is available at http://www.thebreadlab.org/plant-breeding-home/. Congratulations to Shannon Carmody, MS student in the Vegetable Seed Pathology program, on receiving the Alexander A. Smick Scholarship in Rural Community Service and Development. Shannon will receive $2,000 to develop a “Plant Pathology 101” workshop this fall in Mount Vernon, WA under the direction of Dr. Lindsey du Toit with the WSU Vegetable Seed Pathology Program, and a local non-profit, Viva Farms, to provide outreach to Spanish-speaking farmers in the Skagit Valley. The curriculum for this workshop will be designed by Shannon to help beginning farmers answer the question “What’s wrong with my plants?” The workshop will deliver basic information on plant pests, diseases, and nutritional problems, using simultaneous Spanish-English services. Shannon will develop a set of diagnostic questions to help farmers try to understand the problems they see happening in their fields. The workshop will introduce agriculture resources available through the WSU Mount Vernon Northwestern Washington Research and Extension Center (entomology, weed science, horticulture, and plant pathology programs that provide extension and outreach), as well as the WSU Master Gardener program, and the Plant & Insect Diagnostic Lab at the WSU Puyallup REC. Shannon hopes that these funds can be used to develop a relevant and replicable workshop that could be used by others working with similar farming communities in the Pacific Northwest. She is excited to be a part of the Alexander A. and Agnes “Odegaard” Smick Scholarship program because she cannot imagine anything more important than providing tools and resources for the people who grow our food. Shannon enrolled as a graduate student at WSU in January 2015, after working in organic seed and agriculture for six years. Most recently, Shannon was the Operations Director for Viva Farms, a land-based farm business incubator in the Skagit Valley of northwestern Washington that helps beginning farmers and farm workers transition to farm ownership. Prior to that, Shannon worked for 5 years as the Public Programs Director at Seed Savers Exchange in Iowa, one of the largest non-governmental seed banks in North America. At Seed Savers, she was surrounded by an abundant diversity of vegetable seed, ~70 crop types, representing the cumulative work of many agriculturalists. It is at the intersection of seed and the people who grow them that Shannon decided to pursue the study of vegetable seed pathology at Washington State University. Shannon grew up in Rock Island, Illinois, and graduated with a double major in Environmental Studies and International Relations from Beloit College in Beloit, WI. As WSU weed scientist Tim Miller puts it, tulips “go hand in hand with weeds” this time of year in the Skagit Valley, where the annual Tulip Festival during the month of April attracts hundreds of thousands of visitors from around the world to this small farming community approximately one hour’s drive north of Seattle. Yet weeds are only half the battle for the commercial and small-scale growers here who hope to reap a share of the profits from the state’s $12-million-per-year ornamental bulb industry during the short growing and harvest season for specialty cut-flower and bulb crops. The rest of the fight is underground, where soil-borne diseases like tulip fire (caused by the fungus Botrytis tulipae) and tulip-gray bulb rot (caused by the fungus Rhizoctonia tuliparum) can spread through the soil and infect the bulbs of their host plants, resulting in significant losses in flowers and bulb yield. 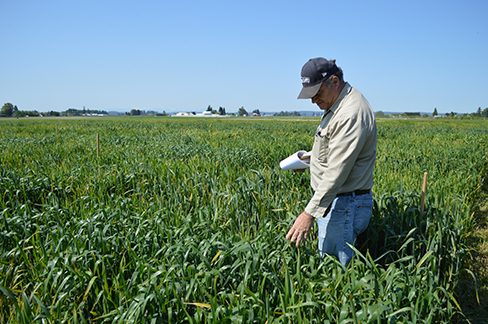 Northwest growers may someday have an added weapon in their agricultural arsenal against tulip bulb weeds and diseases, as a result of cover crop research being conducted by Miller’s WSU Mount Vernon weed science research team, led byPh.D. student Yushan “Sherry” Duan. Duan was enlisted in 2012 to study the impacts of plow-down and cover crops on field production of tulip — one of 25 research projects funded under the Farm Bill through Washington State Department of Agriculture Specialty Crop Block Grants totaling $3 million. In the experiments on Knutson’s farm, half the cover crops were killed with glyphosate, a systemic herbicide, prior to incorporating them into the soil. The other half were not treated. A concern regarding cover crops is that they can persist as weeds in the following crop, leaving what the researchers refer to as a “trashy seedbed” prior to bulb planting. “After the first year, we switched to a cereal rye-pea mix, because we found the winter wheat we planted in late summer was quite weedy in the tulip crop the following spring,” Duan said. In this third year of Duan’s research, results have been surprising and encouraging. Miller and Duan are also conducting companion trials in tulip at the WSU Mount Vernon research station. In a controlled experiment, Duan is infesting soil with the fungi that cause tulip fire and tulip-gray bulb rot prior to planting cover crops to determine if the cover crops can help reduce the incidence of these diseases in the tulip crop. She is working closely with WSU Puyallup Plant Pathologist Gary Chastagner. In the first round of testing, the level of tulip fire was cut by growing a rye-pea mix in August before planting tulip bulbs in October. 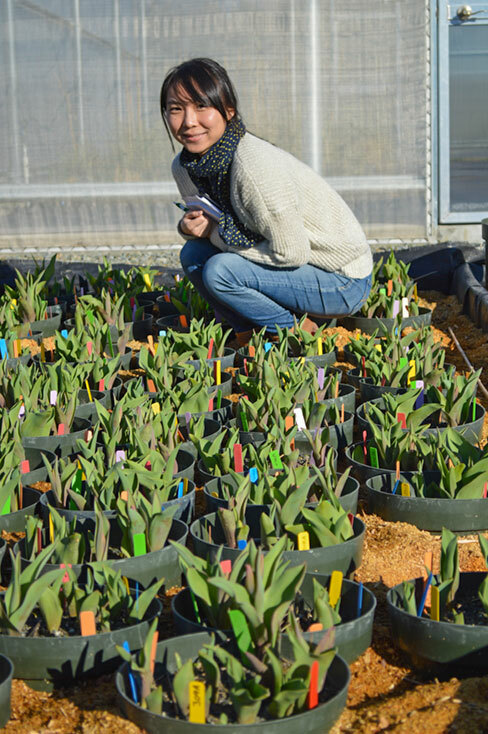 If second-year results are similar, Duan may have identified a strategy producers can use to reduce the risk of tulip fire in field-grown tulips. Both researchers thought they would see a reduction in the fungi which cause tulip fire and tulip-gray bulb rot in the soil plots into which mustard cover crops were tilled prior to tulip planting, because of mustard’s ability to suppress soil-borne diseases. This June marks Duan’s final harvest season with this cover crop project, as she expects to complete her dissertation with three years’ of field data, two years’ of station research, and several greenhouse trials. 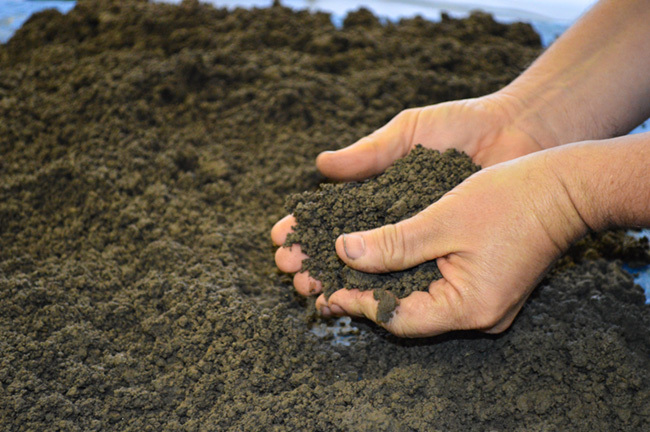 The development of biodegradable mulches has provided some potential eco-friendly benefits to the agriculture industry, but until now there has been no way to determine how these new weed-controlling, moisture-preserving products affect fruit quality. WSU Mount Vernon Small Fruit Horticulture Program Leader Lisa Wasko DeVetteris about to bridge that information gap as the lead scientist on a newly funded research project. Thanks to a two-year, $40,000 grant from the university’s College of Agricultural, Human, and Natural Resource Sciences, DeVetter and two WSU colleagues will study how chemical constituents from deteriorating biodegradable mulches migrate to developing fruits. The grant is one of WSU’s eight “Emerging Research Issues” projects designed to utilize innovative approaches to resolve significant issues – including social and economic factors — faced by the state’s agricultural industries. According to DeVetter, who has been working closely with small fruit growers and researchers in this community for nearly a year now, this project was prompted by some unanswered questions about biodegradable mulch products. Helping fill those gaps are DeVetter’s fellow researchers on this project: Miles, a professor in the WSU Department of Horticulture; and Shyam Sablani, an associate professor with WSU’s Biological Systems Engineering. The research team’s ultimate goal is to help give growers and producers some more sustainable, environmentally friendly options. Washington State University researchers are gearing up to test apple cider qualities this year, thanks to a $40,000 grant announced this month by the university’s College of Agricultural, Human, and Natural Resource Sciences. Carol Miles, horticulture professor at WSU Mount Vernon, leads the team of three researchers who received the award. The grant is one of the university’s eight “Emerging Research Issues” projects which are designed to support innovative approaches to resolve significant issues – including social and economic factors — faced by the state’s agricultural industries. Her WSU project collaborators in Pullman are Peter Tozer, research associate with the School of Economic Sciences; and Carolyn Ross, associate professor in the School of Food Science. 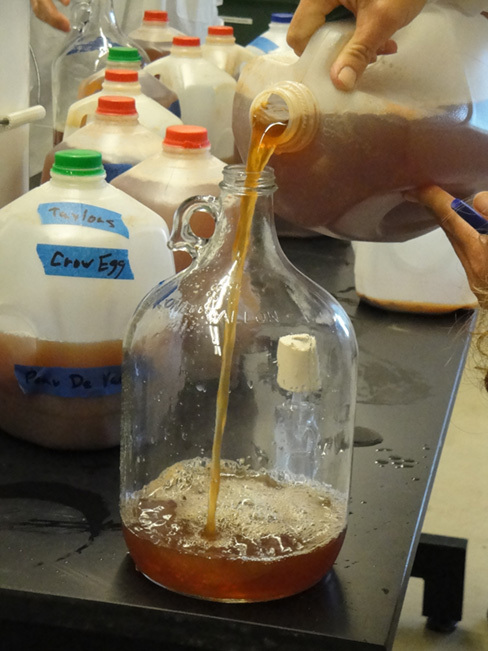 According to Miles, Tozer will determine how cider makers value certain juice qualities, such as tannin level. Tannin is a bitter-tasting organic substance present in some plant tissues. Cider apples have high levels of tannin compared to dessert apples, but it is uncertain if cider makers pay more for juice that is high in tannin. Ross, who is manager of the CAHNRS Sensory Evaluation Unit, will evaluate the sensory qualities of cider made from juice from Miles’ experiments to see whether consumers can detect differences due to location or harvest method. In her analyses, Ross will compare two evaluations methods: a traditional human sensory panel and the electric tongue technology. Once the research results are in, the team hopes both growers and consumers can savor the benefits. “The cider industry will gain a better understanding of the impact of growing environment, location, and harvest method on fruit quality — and whether or not these differences are valued by the cider maker or detectable by consumers,” Miles said. Soil test results help spinach seed growers identify best spots for spring planting. Nearly two dozen spinach seed growers got a heads-up on which local fields may be most conducive to yielding a healthy crop this year, as a result of a WSU Spinach Fusarium Wilt Soil Bioassay Open House held here February 19. Hosted by WSU Plant Pathologist Lindsey du Toit and her WSU Mount Vernon vegetable seed pathology research team, the annual open house was the result of a two-month soil assessment aimed at determining the risk of the disease Spinach Fusarium wilt in commercial fields being considered for this spring’s spinach seed crop plantings. The timing of the open house allows growers to work with seed companies in identifying their top field choices for spinach seed crop locations prior to the March 2 pinning meeting, when 2015 planting sites will be designated by random drawing, du Toit said. In the past six years, 200 fields have been tested in Whatcom, Skagit, Snohomish, Island and Clallam counties. This year, 29 growers brought in samples from 30 fields in this region, where soils are notorious for fostering Spinach Fusarium wilt, which can cause severe economic losses — including leaf wilt, stunting, root necrosis, reduced seed yield, and even total crop failure – in a spinach seed crop. The fungus that causes Fusarium wilt, Fusarium oxysporum f. sp.spinaciae, is able to survive 10-15 years in soil — even when spinach is not present. 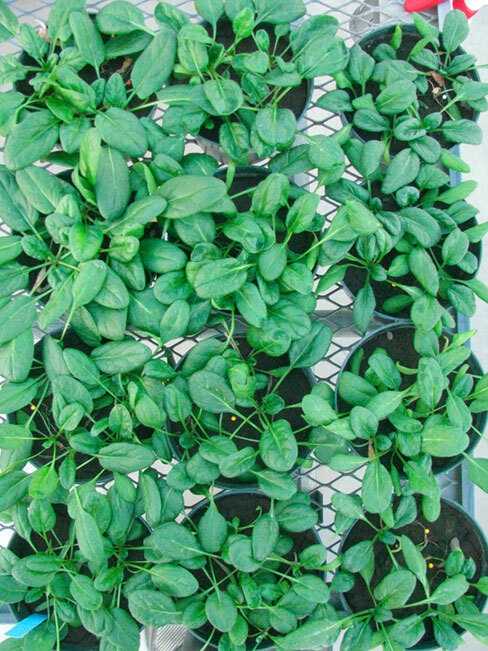 For comparison, plots made from the field soils were each planted with three parent spinach lines, ranging from highly susceptible to partially resistant to Fusarium wilt. Results displayed at the open house made it visually clear which of the tested fields can be safely planted to spinach. Nineteen of the 30 fields – represented by soil plots full of vibrant, leafy, green samples — were identified as low risk for harboring the disease. So even if a line of spinach susceptible to Fusarium wilt is planted, chances are the resulting crop will be productive, du Toit said. 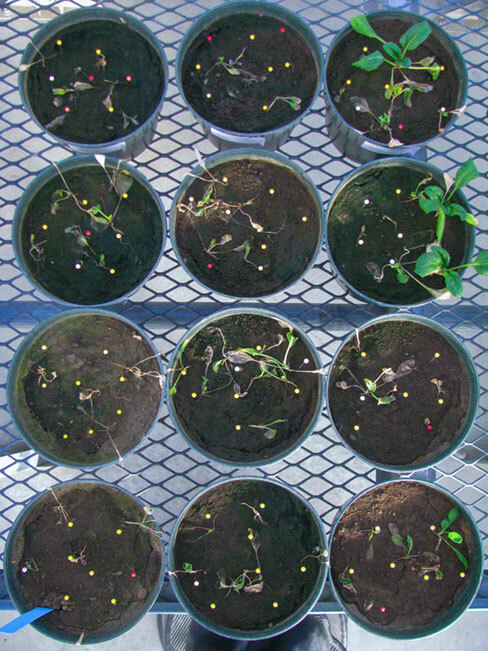 Those field samples yielded soil plots with sparse, yellow, dying spinach plants.